This is an important question to consider because what people believe about Jesus determines their future, today and eternally; and the way people answer the question lets us know how we might reach them with the gospel. Who do Americans say Jesus is? Most Americans believe that Jesus was a real person. The younger generations are less likely to believe him to be God. Our populace is split on whether they believe Jesus was sinless. Jesus embodied the great characteristics of these men. However, he cannot be ranked with other men, even great men. More than living righteously, Jesus is righteousness. More than being a great teacher, Jesus is truth. More than revealing truths about God, Jesus is God in the flesh. More than being a messenger of God, Jesus is the Word of God. The answer to this question reveals what you believe and reveals your eternal destiny. 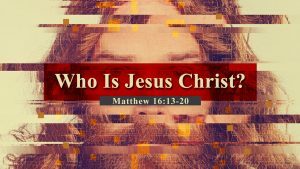 · Jesus is the Christ – he is the Anointed of God, the true Messiah, (Acts 2:36) in whom all the promises of God are fulfilled (2 Corinthians 1:19-20). · Jesus is not merely a man; he is God the Son (Luke 9:35). · Jesus is the Son of the living God – he is life and the source of life (John 11:25-26). Jesus is the Christ, the promised Messiah. He is God’s own Son. He is God in the flesh—fully man and fully God, who came to save sinners. 1. Receive life through him—new life, spiritual life and eternal life. 2. Enter the kingdom of God through him. Throughout his ministry, Jesus revealed his identity. God helps us to believe and confess Jesus, so that we may have new life in him. “Blessed are you, Simon Bar-Jonah! For flesh and blood has not revealed this to you, but my Father who is in heaven. None of us “figure out” the truths about Jesus Christ or God’s salvation. God the Father reveals these things to us. If Jesus has made himself known to you as God and you testify of this truth, then you’re in good company. · Thomas, the disciple of Jesus, declared Jesus as “My Lord and my God” (John 20:28). · The Apostle Paul wrote of Jesus, “Our great God and Savior, Jesus Christ” (Titus 2:13). · The Apostle Peter wrote the same of him, “Our God and Savior Jesus Christ” (2 Peter 1:1). · God the Father testifies of Jesus’ deity through progressive revelation, saying, “Your throne, O God, is forever and ever. The scepter of your kingdom is a scepter of uprightness” (Psalm 45:6 ESV). He foretells about Jesus being divine through the prophet Isaiah, who wrote of him saying, “For to us a child is born, to us a son is given; and the government shall be upon his shoulder, and his name shall be called Wonderful Counselor, Mighty God, Everlasting Father, Prince of Peace” (Isaiah 9:6 ESV). It is essential for every person to come to understand that Jesus Christ is God in the flesh. As God, only he could die in our stead to pay the penalty for ours sins and the sins of the whole world (1 John 2:2).